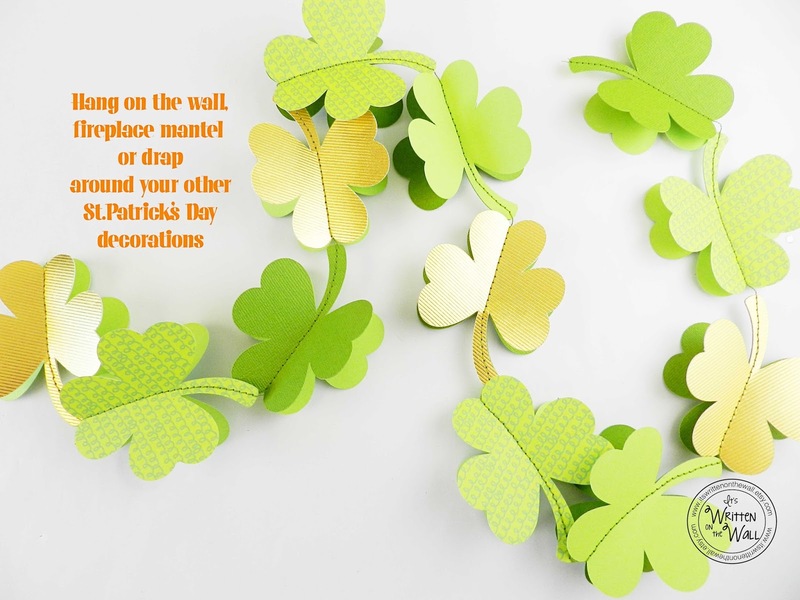 It's Written on the Wall: Tutorial for St. Patrick's Day Garland / Banner-Super Simple! Tutorial for St. Patrick's Day Garland / Banner-Super Simple! 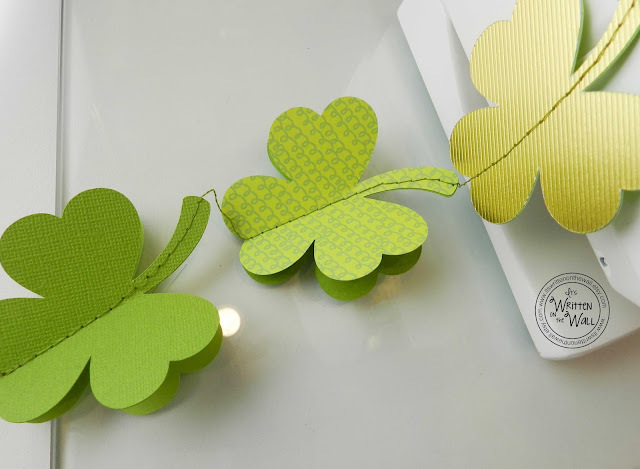 St. Patrick's Day is right around the corner, and time to think about decorations. This St. Patrick's Day banner is sooooo simple to put together. The hardest thing might be choosing the colors to make it out of! As it says above, banners aren't meant just to hang on the wall. Use it in other ways, perhaps draping around some of your other decor. Hang it on the wall vertically or horizontally. Choose at least 2 different colors for your banner. You can use as many as you like though. We used 4 different pieces of cardstock....light green, dark green, gold, and one with a design. Be sure to select colors that compliment one another. A good Irish red would have been fun to add into my banner. 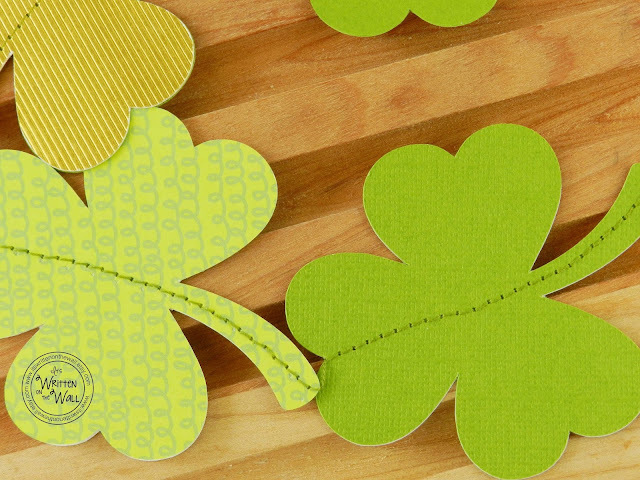 After cutting out your shamrocks, put them in pairs. Then place your shamrock pairs in the order that you want them to appear in the banner. Then you can start sewing. Use a scrap piece of cardstock to sew lines until you get the stitch to look the way you want....not too tight, not too loose. I have a Bernina sewing machine and the straight stitch length is set on 2. The zigzag stitch length is set at 0. 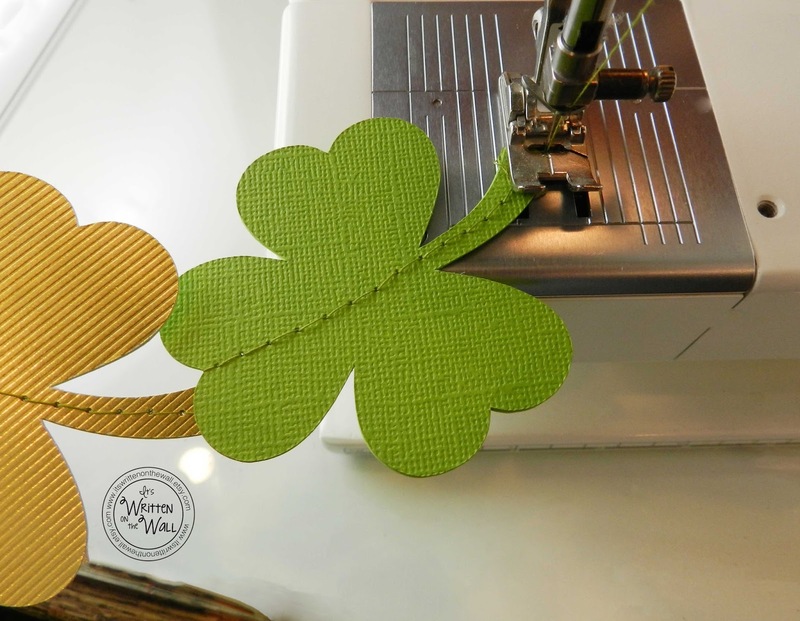 Now stitch down through the middle of each shamrock and through the stem. I always let the machine run for 5 to 8 stitches in-between each piece. This will provide a little space between the shamrock. Be sure to use a thread color that matches your main colors. We used green here. Here is the beginning of our banner, three shamrocks down 15 more to go. The length of this stitch is good. As I said before, not too tight, not too loose. Our shamrocks measured 2.5" wide and 3" tall. You could cut them out yourself, or find a shamrock paper punch etc. 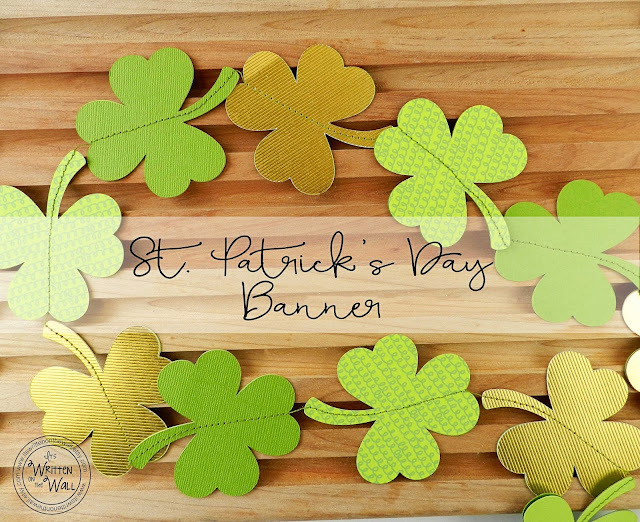 You could also make your banner one dimensional by sewing just one shamrock at a time instead of putting 2 shamrocks together. It would basically look like this photo. Now all that's left to do is fold each shamrock in towards itself. The stitching line makes it easy to bend. Now just hang your wall quote on the wall, the fireplace mantel or around your other decorations. This one can also be hung horizontally as we faced the shamrocks going all the same way. Have fun making one for yourself! 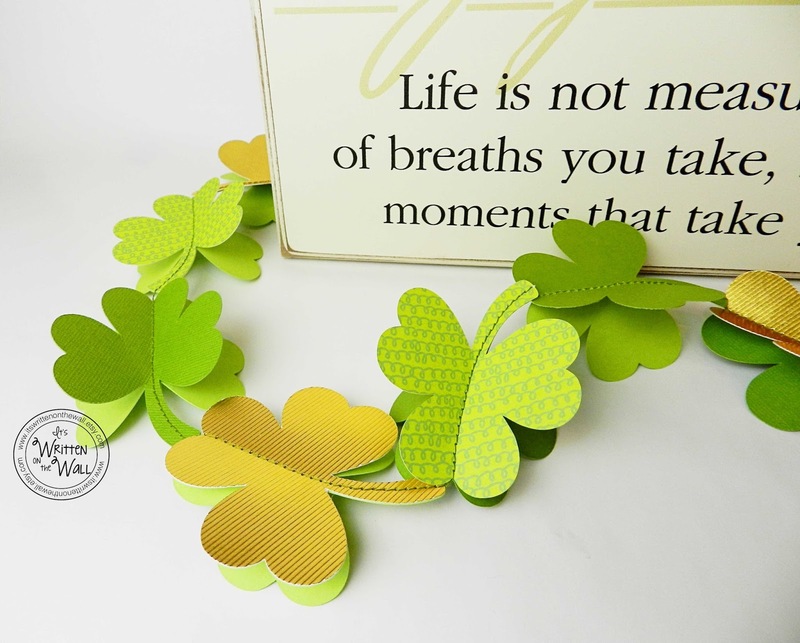 We have some really cute printables and kits that would be perfect for your St. Patrick's Day celebration in our Etsy shop. 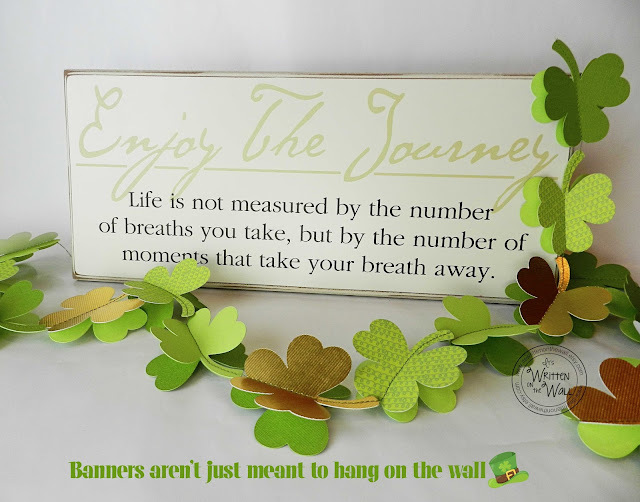 Click HERE to see everything in our Etsy shop INCLUDING a kit for all the cut out shamrocks you would need for this banner.